Here’s The Trailer For White Boy Rick! Now, White Boy Rick is based on a true story that’s actually pretty interesting. At the age of 14, Richard Wershe, Jr. was the youngest criminal to ever become an informant for the FBI. Of course, once the FBI got what they wanted from him, Wershe was left on his own and, when he was 17, he was arrested for selling cocaine and sentenced to life in prison. Wershe, who was finally paroled in 2017, claims that the harsh sentence was politically motivated and that he basically learned how to become a successful drug dealer through his work for the government. It’s a great story and, with more and more people questioning both drug prohibition and national law enforcement, a timely one. The film’s got a good cast, with Matthew McConaughey, Jennifer Jason Leigh, Bel Powley, Rory Cochrane, Piper Laurie, and Bruce Dern all in supporting roles. The director, Yann Demange, previously directed the great ’71 and is definitely an up-and-coming filmmaker. Rick is played by a Richie Merritt, who will be making his film debut in the leading role. As for the trailer itself, it’s effective. I had a hard time understanding some of the dialogue and it’s hard to really judge Merritt’s performance based on what’s present here. But I like the look of the trailer and the music is damn near perfect. Some are saying this movie might be an Oscar contender. We’ll have to see! 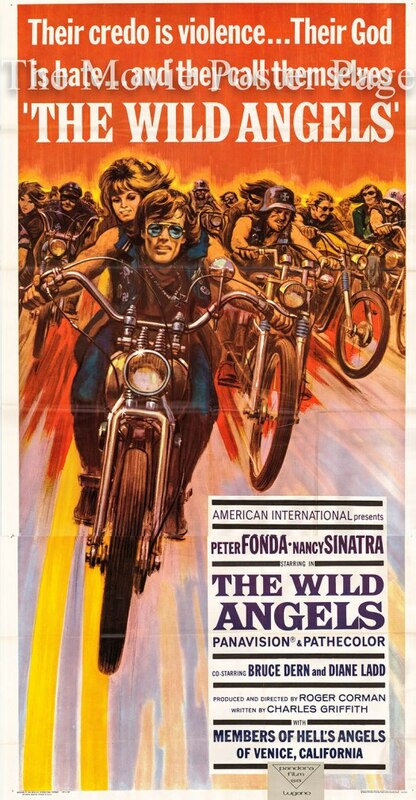 Roger Corman kicked off the outlaw biker film genre with THE WILD ANGELS, setting the template for all biker flicks to come. Sure, there had been motorcycle movies before: Marlon Brando in THE WILD ONE and the low-budget MOTORCYCLE GANG spring to mind. But THE WILD ANGELS busted open box offices on the Grindhouse and Drive-In circuits, and soon an army of outlaw bikers roared into a theater near you! There was BORN LOSERS , DEVIL’S ANGELS, THE GLORY STOMPERS , REBEL ROUSERS, ANGELS FROM HELL, and dozens more straight into the mid-70’s, when the cycle cycle revved its last rev. But Corman’s saga of the freewheeling Angels was there first; as always, Rapid Roger was the leader of the pack. 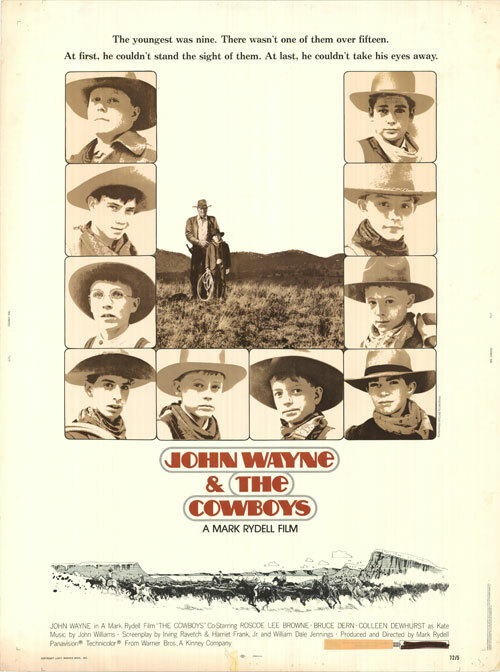 THE COWBOYS is not just another ‘John Wayne Movie’ from the latter part of his career. Not by a long shot. Duke had read the script and coveted the part of Wil Andersen, who’s forced to hire a bunch of wet behind the ears adolescents for a 400 mile cattle drive across the rugged Montana territory. Director Mark Rydell wanted George C. Scott for the role, but when John Wayne set his sights on something, he usually got what he wanted. The two men were at polar opposites of the political spectrum, and the Sanford Meisner-trained Rydell and Old Hollywood Wayne were expected to clash. They didn’t; putting their differences aside, they collaborated and cooperated to make one of the best Westerns of the 70’s. Four former high school basketball players and their coach gather for a reunion in Pennsylvania. Twenty-five years ago, they were state champions. Now, they are all still struggling with the legacy of that championship season. George (Bruce Dern) is the mayor of Scranton and is in a fierce race for reelection. Phil (Paul Sorvino) is a wealthy and corrupt businessman who is having an affair with George’s wife. James (Stacy Keach) is a high school principal who is still struggling to come to terms with his abusive father. James’s younger brother, Tom (Martin Sheen), is an alcoholic who can not hold down a steady job. The Coach (Robert Mitchum) remains the Coach. All four of the men still want his approval, even though they know that he is actually an old bigot who pushed them to cut too many corners on their way to the championship. Though Cannon film may have been best known for producing action films with actors like Charles Bronson, Chuck Norris, and Michael Dudikoff, they occasionally tried to improve their image with a prestige picture like That Championship Season. Not only is this film based on Jason Miller’s Pulitzer Prize-winning play but Cannon also hired Miller himself to direct. (Before Miller was brought in, That Championship Season was nearly directed by William Friedkin, who directed Miller in The Exorcist.) While no one knew the text better than Miller, this was also his directorial debut and sometimes, his inexperience shows. The first half of the movie does a good job of opening up the play but the second half takes place almost entirely in the Coach’s house and is very stagey, never escaping its theatrical origins. One thing That Championship Season has going for it is an excellent cast. Dern, Sorvino, Keach, and even Sheen rarely got roles with as much depth as the ones that they got here and four of them make the best of the opportunity. As for Robert Mitchum, he was known for being a mercurial actor but here, he gives one of the better performances of the latter half of his career. Because of the efforts of the ensemble, That Championship Season is one of the better Cannon prestige pictures, though Chuck Norris is still missed.